As you may or may not know I'm a huge MUA Cosmetics fan, their great quality make up for teeny tiny prices always lures me in, so when I heard MUA where adding two new lipsticks into their Matte Lipstick Collection I just knew I had to try them out. MUA's Matte Lipstick Collection now consists of 7 lipstick shades in total ranging from nudes to more vibrant shades with a berry shade thrown in for good measure, there's definitely a matte shade for everyone in the collection. The two NEW shades that MUA released for Spring 2014 are called Lilac Belle and Fawny Fancy, both shades seem to be extremely popular and I actually haven't managed to get my hands on Fawny Fancy as of yet so I thought I'd just go for it and review Lilac Belle for you all today! The packaging for Lilac Belle carrys the same theme as the rest of the MUA Matte Lipstick family with the standard, sleek looking, white plastic packaging and they still come complete with the cutest little surprise at the bottom, a small twist off jar with the same matte lipstick shade inside, its a little addition I've always loved by MUA. Now onto the lipstick itself... Lilac Belle is a gorgeous pinky shade with a lilac undertone which is perfect for Spring/Summer months and has a matte-satin finish, can I also just add how gorgeous and cute the shade name is... I just love it he he! 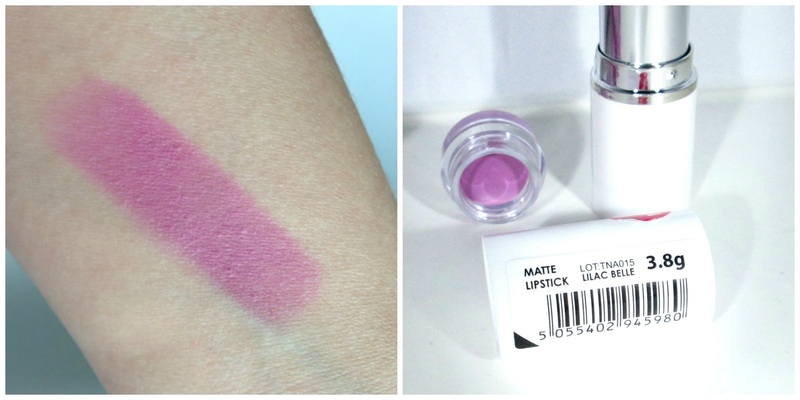 I was expecting Lilac Belle to be quite drying on the lips because it is a matte lipstick after all, however... It feels super lightweight and doesn't dry my lips out at all, the texture of the lipstick on the lips obviously feels dryer than the standard MUA lipstick but then that's to be expected with matte lipsticks, but I can honestly say it feels very comfortable to wear. The formula of Lilac Belle in the bullet is actually alot softer and somewhat smoother than the other MUA matte lipsticks I own such as Wild Berry and Scarlet Siren as they both feel slightly waxy but Lilac Belle feels alot creamier which is nice and has a good depth of pigmentation too! As for the application process... 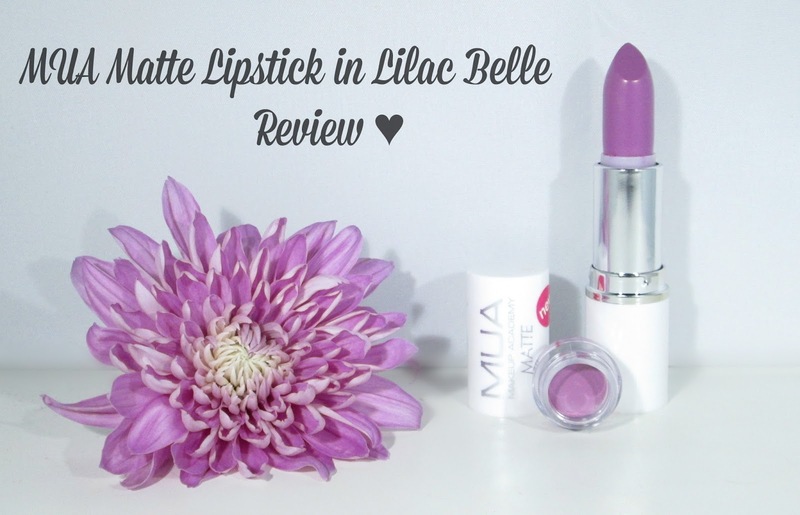 It's lovely, it glides on well and doesn't drag on the lips at all which makes a nice change as alot of matte lipsticks are prone to pull on tug on the lips as the formula can be harder but Lilac Belle does neither woohoo! The lasting power of Lilac Belle is good, after around 3ish hours I could use a top up but you are left with a pretty pink tint to the lips as the lipsticks wears off which personally I like as it still gives the illusion that you have lipstick on he he. Overall I have to say MUA have triumphed yet again with another amazing new release. Lilac Belle is so wearable for the Spring/Summer months, it has a good amount of pigmentation, feels nice and lightweight on the lips and of course is extremely affordable at just £1... Yup that right one single little pound!!! What a beauty bargain! I just love it! Have you tried Lilac Belle yet beaut's?? Or any of the other MUA Matte Lipsticks?? What did you think?? I'd love to know! Make sure you check out my MAC lipstick giveaway! Click here! Just 2 days left! I LOVE this shade! Its so girly & fun! I recently bought my first MUA lipstick and I was so impressed, I can't believe they're only £1. Crazy! This shade is gorgeous! That looks like an actually wearable lilac colour. You never know with purples how they'll actually look on but this one is just soooo pretty. I have this and I find that it's so pretty for summer days out, such a bargain!